The Kennedy half-dollar coin, minted since 1964, is a fifty cent coin issued by the United States Mint. It was intended to memorialize President John F. Kennedy, who was assassinated on November 22, 1963. Authorized just a month after his death, it was rushed into production in January 1964. This coin, with a face value of 50 cents, measures 30.6mm in diameter. 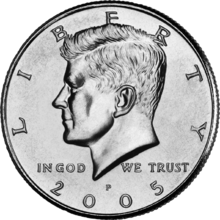 The obverse features a portrait of John F. Kennedy designed by Gilroy Roberts. The reverse is a modified presidential seal designed by Frank Gasparro, which consists of an eagle with a shield, holding an olive branch and a bundle of arrow. Fifty stars surround the design in a ring. In 1976, a special deign for the reverse was issued for the United States Bicentennial. Each coin carries a mint mark of either D (Denver), S (San Francisco), or P or Blank (Philadelphia). The Kennedy Half Dollar composition has varied over the history of the series. Upon the coin’s 1964 introduction, they were composed of 90% silver and 10% copper. It is these early Kennedy half dollars which are collected by precious metal investors because of their high silver content (0.36169 troy ounces) when compared with later issues. From 1965 to 1970, the coin consisted of an outer layer of 80% silver and 20% copper, surrounding a core of 79% copper and 21% silver. These are known as 40% clad Kennedy half dollars. Some 1776-1976 bicentennial issue Kennedy coins also used this composition, which has a total of 0.1479 troy ounce of silver. Since 1971, the coin has not contained any silver. Instead, it has been made with an outer layer of 75% copper and 25% nickel surrounding a core of 100% copper. Because of the changing composition, the weight of this coin has also changed throughout its history, from 12.50g to 11.50g, and finally to 11.34g. Immediately upon its introduction, the coin virtually vanished from circulation due to collectors, silver hoarders, and people who wanted the coin as a memento of the late president. The initial plan of 91 million half dollars for 1964 was eventually raised to 430 million to satisfy immense demand for the coin. Though the Mint greatly increased production, but the half-dollar still failed to circulate due to continued rises in silver prices. As a result, many were melted down for their silver content, making early-issue Kennedy coins difficult to find despite their high mintage. Because of still-rising silver prices, the Kennedy half dollar’s silver composition was reduced to 40% for 1965, and in 1970 was eliminated entirely. Over the history of this coin, production has remained fairly steady, rarely dropping below 20 million per year. As a result, these collectible coins remain affordable. As a result of delays in changing the metal composition of the coin, the 1970 Kennedy is considered to be among the hardest to find of all Kennedy half dollars, although even then, at least 2 million such coins were struck. Following the high numbers struck for the 1976 Bicentennial, the number of Kennedy half dollars struck each year declined. Though the coin is still being minted, since 2002 they have only been struck in smaller numbers to satisfy demand from collectors, rather than for use in circulation.